Depression can hit at any moment. For me, it happened when things were going well. We lived in Philadelphia at the time. Even though I was happily married and all of our children were young and seemed to be getting along fine, I felt alone. The overwhelming pressure of supporting them was continuing to build and I felt like taking my own life. It was the middle of the night. Everybody else was asleep upstairs. And I was down in the living room, pleading with the Lord. The pressure had been building up to the moment when finally the Lord used a verse in Isaiah to send me this simple message: I have not forgotten you, I am still with you. God broke through and I found healing. And while the Lord didn’t come as quickly as I expected, He still was there and He made himself known as I couldn’t sleep and spent an entire night wrestling with him, much like Jacob in Genesis 32. I pleaded for the Lord’s blessing and He gave it. I took some medication for my depression, and I have no regrets about that, but my true hope and help didn’t come from a pill—it came from above. Dealing with depression is not easy. And I’m not going to offer simple steps that are guaranteed to cure it. Instead, I want to encourage you with a Psalm. 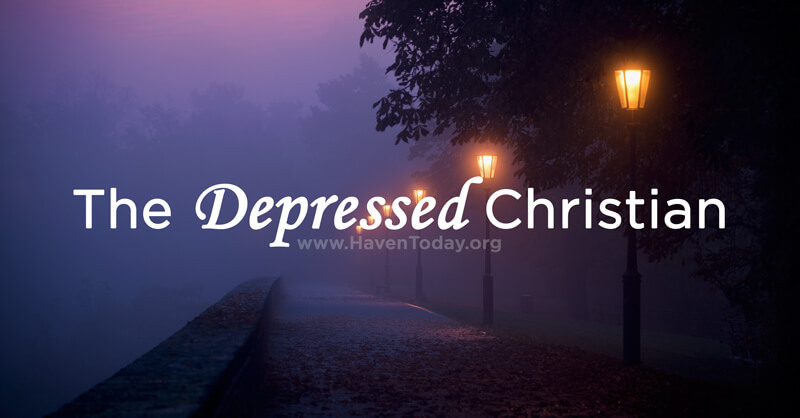 One thing my friend Dr. Ed Welch, author of Depression: Looking up From the Stubborn Darkness, says when counseling Christians is that if you are dealing with any level of depression, we should soak in the Psalms. Psalm 16 is a great example of where we can turn when the crushing weight of depression seems to close in around us. It starts out as “A miktam of David,” which means we are reading a royal prayer by King David, and as God’s royal people we can pray it, too. What a relief to find that the first thing the Lord wants us to do is take refuge in Him. Refuge is a major theme in the Psalms, and as believers we can pray this prayer because we have already taken refuge in Him. We’ve taken refuge from judgment, refuge from our enemies, refuge from life itself with all its troubles. And when we’re in a crisis we can remind the Lord of this fact and ask Him to keep us safe. Everyone wants good things to come into their lives, but most of the world doesn’t know where they come from. In this verse, David is remembering what he said to the Lord in the past and he’s taking a stand there again. He knows that his Lord is a great giver. Every good thing in life comes from him—by grace—and not because we deserve it. David knows that God’s generosity is overflowing, but we should know this even better than David because we know that God gave us His own Son. In David’s day these gods were actual stone idols. People worshipped them for what they could get out of them. They poured blood out on the altars so the gods would give them what they wanted. In our day the idols are more subtle. Things like body image, money, power, applause, security captivate us now. We need to grasp the sobering reality that idols don’t but make our sorrows increase. David just sort of sits back and revels in everything the Lord has given him. He has the eyes to see reality as it really is—to see that even though he might be in trouble, and even though all around him unbelievers are living in comfort without all the troubles he has in his life, still, he’s the one who’s blessed. He’s the one who’s rich — because he has the Lord. Being disinherited by the world can be an honor and a blessing because it points us to our true inheritance. God didn’t give the Levites any land but he gave them something better, he said, “I AM your portion and your inheritance.” David looks around at his portion and he says, This is a really nice place. It’s not hot and dry and ugly and I don’t want to be anywhere else. We need eyes to see the inheritance we have in the Lord, and that we’re the ones who’re truly rich. In these verses, David is still looking around at his inheritance and seeing how good it is. He praises the Lord who counsels him. Those who chase after other gods are on their own, trying to figure things out for themselves. But not David. The Lord counsels him and fills his heart with truth. This is the privilege of every believer. Jesus promised to send us the Spirit of truth in John 16:13, “When he, the Spirit of truth, comes, he will guide you into all truth.” Imagine the privilege we’ve been given that the living God counsels us. In the midst of our confusion, He leads us out into the light. And David knows what this means – it means he’ll never be shaken. He’s set the Lord before him – and he won’t be moved. The truth that the Lord taught him is like a shield, a defense. As believers in Jesus, we can all get dragged down by the enemy, who wields weapons of accusation, temptation, condemnation, and confusion. But we who have set the Lord before us can handle this enemy. Because the Lord is at our right hand, we will not be shaken. At this point, David is overflowing with joy. He knows he doesn’t have to worry about his physical body because the Lord isn’t going to leave him in the grave. In the book of Acts, Peter says this passage is really talking about Jesus because David was still buried in his tomb, yet Jesus was physically raised from the grave. But it also means that because Jesus was raised, David and all of God’s people are going to be raised from the dead and given new glorious, imperishable bodies. Knowing this means we don’t have to worry about anything. The Lord has shown us the path of life and he’s walking in it. We, like David, know what the future has in store for us. We will be resurrected and filled with joy in the presence of the Lord. I think that being sure about these things—this future—sets us free to live an all-out life for the Lord. Even in the midst of depression, we can pray these words with David and live like we believe them. In this way, we’ll experience the joy that comes from living all-out for our Savior, Jesus Christ. If you have someone you know and love who is depressed, and you want to help them find that simple pill, that piece of advice, or some sort of quick answer to pull them out of that deep, dark hole—I’m sorry to say you won’t find it here. As much as we all hope for the easy fix, that doesn’t happen when it comes to depression. But Christians will always have the hope that comes from the Lord because He is truly our refuge and strength. Charles Morris serves as speaker on the radio program HAVEN Today. Most of the thoughts above are taken from related broadcasts of the program. Corum Hughes serves as editor of this blog and helps coordinate digital media for Haven Ministries. A graduate of Moody Bible Institute, Corum lives in Boise, ID with his wife Molly. Great Word so does this mean that taking medication is wrong. I suffer from recurring depression. I always turn to the book of psalms when I start feeling down. I am on medication and I have received cognitive behavior therapy however I have found that receiving prayet ministry helps to lift me out of depression. Praise the Lord for those moments when you are lifted from your depression! And thanks so much for sharing your experience with us. Thank you for the amazing information about depression blog .all the steps are important when we suffer from depression. I get motivated by the post and alert from mistakes.thanks for sharing this. In normal life people daily suffers from this problem. our PARIJATAK AYURVEDA Also provides the treatment for depression. Due to competitive lifestyle, many peoples in the world were suffering from this Depression. Near about !0% of the population suffered from this problem. In Ayurveda, it is called as Vishaad or Manoavasad. Depression not only affects the mind but also it affects the body of the person.